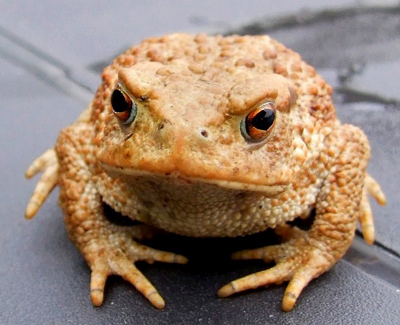 Here are some crazy facts about amphibians you might not know. Amphibians are an amazing and diverse form of animal life. Their dramatic life cycles and unique habitat requirements make them particularly interesting and sometimes surprising subjects to study. Compared to mammals, which have a pretty consistent life cycle and reproductive pattern with a few exceptions (I’m looking at you, marsupials), amphibians are all over the board. 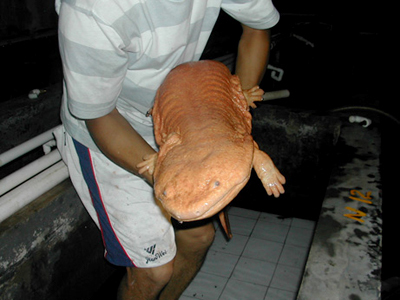 Most amphibian species need to lay their eggs in water to keep them from drying out. Their young typically go through several stages of metamorphosis where major physiological transformations can take place in a relatively short time span. Other species are able to skip this step entirely and hatch from their eggs as miniature adults. Most Caecilians, which are the obscure hipster amphibians that you have probably never heard of, (they look like earthworms or slimy, eyeless snakes) actually give birth to already developed offspring without having to lay eggs! Make up your mind, amphibians. Amphibians have very thin, permeable skin that allows water and air to pass through. This process relies on their skin being moist. If an amphibian dries out too much they can start to literally suffocate. One of the craziest facts about amphibians is some smaller species of salamanders and at least 1 species of frog don’t have lungs at all and rely entirely on their skin for respiration! 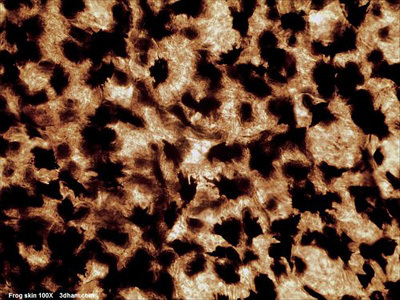 The image above is a close up of frog skin magnified 100 times. There is no scientific, taxonomical distinction made between frogs and toads. The only real difference is in outward appearance (namely the appearance of dry skin and wart-like glands) which has caused people to adopt different common names for different species. Having a long tail seems like it would be a huge liability in the survival game. After all, who would want an obvious convenient carry handle permanently strapped to their back while they are avoiding larger predators? Salamanders get around this with autotomy, the ability to voluntarily sever their own tail and re-grow a new one later. The severed tail continues to thrash and twitch, confusing the salamander’s would be predator long enough to make a hasty escape. The tail is eventually replaced over a span of weeks with a new, slightly shabbier version made of cartilage and discolored skin. Amphibians have persisted on this planet for over 360 million years, surviving several mass extinction events along the way. Some species go to extreme lengths to survive in harsh climates. Perhaps one of the most extreme facts about amphibians is that the Wood Frog (Lithobates sylvaticus) can survive being frozen solid. Its heart stops beating, its blood is completely turned to ice and ice crystals will actually form under its skin. How can it survive this? 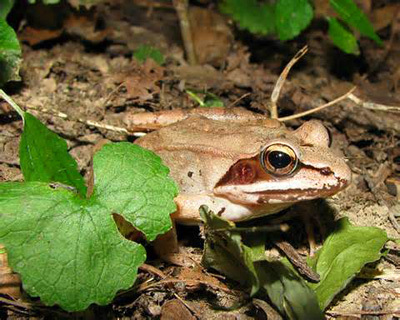 The Wood Frog’s metabolism drops into a state of torpor and it uses sugars stored in its liver to flood its vital organs with glucose, which prevents destructive ice crystals from forming inside of its tissue. Once it thaws out, the Wood Frog can keep hopping along like nothing happened. 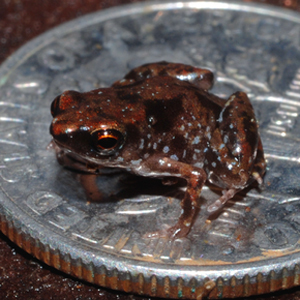 The smallest living vertebrate is Paedophryne amauensis, a frog native to the jungles of Papua New Guinea. At maturity, they are typically less than 1/3 of an inch long! These diminutive frogs are also distinct because they do not go through a tadpole stage in their life cycle. They emerge from their eggs as fully formed miniature versions of adults. They Used to be REALLY Huge! That title belongs to Prionosuchus plummeri, a South American amphibian that lived during the middle Permian (270 million years ago). This swamp dweller had a crocodile-like body and could grow up to 30 ft. in length! For perspective, that’s roughly the length of a full size school bus. Paleontologists theorize that Prionosuchus was an ambush predator judging by its body type and dentition. 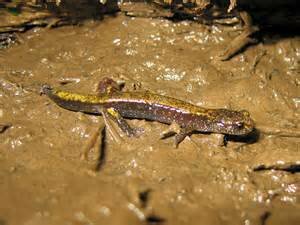 Salamanders are the only vertebrates that are capable of full blown limb-regeneration. Their bodies are able to re-grow fully functional, complex bone and muscle structures. Scientists have been studying the process for decades in the hopes of reverse engineering it into humans. Wildlife Tracking Courses at Alderleaf.